There was an old lady who swallowed a fly. And a spider. And a bird. And a cat. And a dog. And a snake. And a cow. And a horse. Do you know what happened to her? Of course you do! But take another look. Jeremy Holmes has taken a well-loved verse, There Was an Old Lady Who Swallowed a Fly, and turned it into art. The book is cleverly formatted – the rectangular shape shows the old woman standing up and her mid-section is the book, so that as the verse progresses you are looking inside her stomach to see what she has eaten. 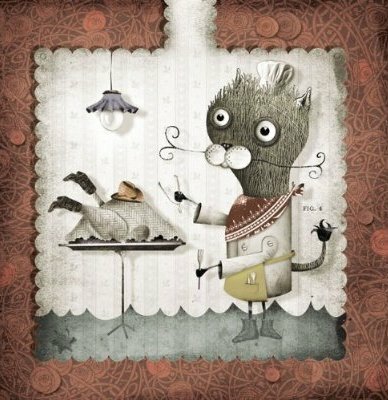 All the creatures are drawn in Holmes’ unique style – the fly is illustrated as an explorer, complete with map and telescope, the bird is dressed in cowboy boots and a bandana followed by the cat, depicted as a chef tucking into a roast bird that is still wearing its cowboy boots. It’s no surprise that the old lady dies but Holmes’ version delivers something new – as you turn the last page the old lady literally closes her eyes (via some tricky paper engineering). The whole effect is stunning although the jury is still out at my house – three of my kids think it is ‘unreal’ but one thinks it is ‘a bit scary’. Nevertheless, I’m still asked to read it many times over so I guess children like to be thrilled in the same way as adults who watch suspense movies. You’ll enjoy this book for its exquisite illustrations – you really can’t help but follow, through the pictures, the demise of each animal that is swallowed. The clip below captures the dark mood of the book. There Was an Old Lady Who Swallowed a Fly by Jeremy Holmes is available from Fishpond for $19.99.